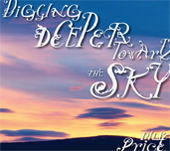 Digging Deeper Toward the Sky is the follow-up EP to the I Can't Stop Looking at the Sky project. "The songs are about the same themes, but they didn't really fit—not only in terms of space, but in terms of style," Price says. While the I Can't Stop Looking at the Sky project is much more open-ended lyrically and more varied in song style and instrumentation, these five new songs are much more direct and acoustic-based. They are more along the lines of what most people would term "singer-songwriter."